ORIGINAL BRITISH UK CINEMA QUAD. RARE 100% ORIGINAL UK CINEMA QUAD. PICS ARE OF ACTUAL ITEM WINNER WILL RECEIVE. PLEASE CHECK OUT ALL THE PICS FOR POSTER CONDITION THEY FORM THE BEST DESRIPTION. 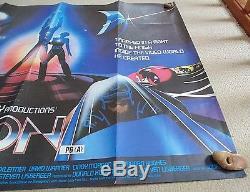 100% GENUINE BRITISH UK QUAD POSTER WHICH WAS USED AT THE CINEMA FOR PROMOTION OF THE SAID FEATURE FROM BACK IN THE DAY 1982. IT IS FOLDED AS ISSUED TO THE CINEMA. ONLY LIGHT WEAR CREASING TO FOLDS. FEW SMALL NICKS TO BORDER EDGES. 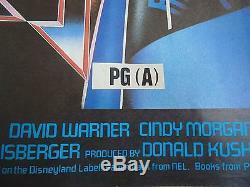 PG/A CERT STICKER TO LOWER HALF OF POSTER. WILL BE SENT OUT IN A STRONG POSTAL TUBE. NOTHING TO HIDE HERE YOU DECIDE! SIZE APPROX : 30 X 40 INCHES. FOLDED AS ISSUED TO THE CINEMA. 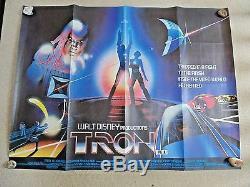 80's CLASSIC WITH VERY COOL ARTWORK. HAPPY TO POST WORLDWIDE WITH TRACKING. 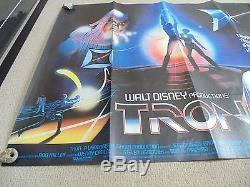 The item "TRON 1982 ORIGINAL CINEMA QUAD MOVIE POSTER 30 X 40 NICE WALT DISNEY RARE" is in sale since Sunday, June 25, 2017. 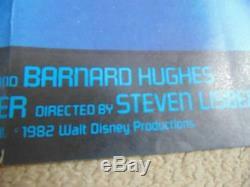 This item is in the category "Collectables\Vintage & Retro Collectables\1980s". The seller is "sexysi247" and is located in Romney Marsh. This item can be shipped worldwide.